4/17/2015Share this story on Facebook! She moved 10 times before she was 18. She loves animals and has two cats and two dogs, one of which only has three legs. She once drove to Germany for dinner. She has a bachelor's degree in psychology that she uses a lot in her marketing research. Brandon Xing ’15 is a financial application support analyst with the FDM Group, an IT services provider. Stephanie Lemmons ’14 is trip coordinator at Heart for Africa in Atlanta, Georgia. Katie Williams ’14 is on the staff of Ernst & Young’s Business Advisory Program in Boston. 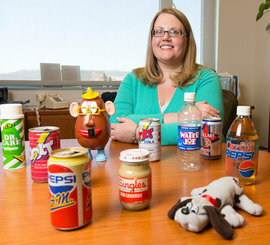 For Alison Shields, assistant professor of marketing and law, there is “more than meets the eye” in her consumer behavior research. After watching people’s responses to the new Transformer’s films and remembering their popularity growing up in the '80s, she decided to pursue nostalgia marketing. This niche study looks at how adults feel toward a brand based on their connection to it as a child. Prior to coming to Ithaca College, Shields was an assistant product manager at American Greetings, the world’s largest greeting card company. Q: How did you get interested in the topic of nostalgia? A: When they started re-releasing [the Transformers] movies, I noticed that some people were very excited about them, but a lot of people, who were particularly nostalgic for Transformers, were actually getting really cranky. This was before they had even seen them. “They’re not going to be the same”…“They changed BumbleBee” … the list of complaints I got from people could have gone on and on. I thought that was really interesting, because if you’re nostalgic for something, you should be happy to see it coming back, but what I was seeing was that wasn’t actually the case. I decided to look at what companies can do to capture that nostalgia. Assistant professor Alison Shields discusses how a brand can create a strong nostalgic connection. Q: Can you give an example of a consumer product that successfully captured nostalgia? A: The most successful example was the Volkswagen Beetle. The ‘50s and ‘60s, the baby boomer generation, this was their first car. It was affordable for them; everybody had one; it was what they drove. When they reintroduced it, they went after the same market. The VW Bug went from being an affordable, everyman car to a $35,000 car. This time they were targeting the same people who loved it before, but now with their adult salaries. Q: Are kids today different than the kids of 50 years ago in terms of brand loyalty? A: It depends. In some things they are more adventure seeking and willing to switch. In my research, I’ve been talking to college students, and I’ve had them tell me that they formed nostalgia with brands as early as when they were 3 or 4. You need to have ritualized behavior, regular consumption, and ties to friends and family for this nostalgia to exist. There still is that same “looking for connection” that kids had 50 years ago. Q: What would your advice be for a new product to establish that nostalgia factor? A: It takes time. You’re going to have to be patient; it’s not something that will happen overnight. They need to come up with ways to create that ritualized behavior. Also, they need to give people a stress point. A lot of times when you’re stressed you tend to revert to comfort habits. Giving people a reminder of a product they had as a kid, initiates the feeling of being taken care of. This is the best way a brand can initiate nostalgia.